Elaine Ng(吳綺莉) Finally Admits To Hitting Her Daughter? In 1999, Elaine was crowned the winner of ATV's Miss Asia Pageant. In 1999, she fell in love with the already married Jackie and gave birth to Etta illegitimately. Currently, Etta has been living with Elaine for the past 15 years. Unexpectedly, Etta told her school that she was hit by her mother. 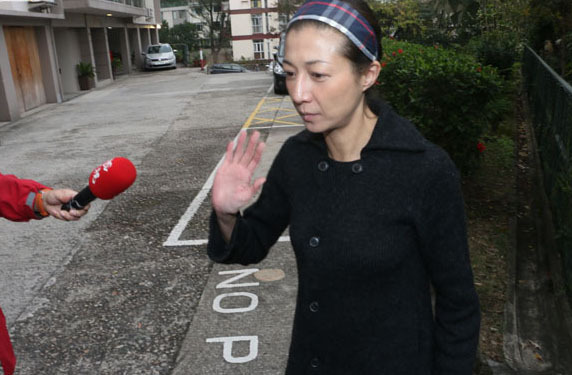 Since Elaine was arrested for child arrest, the police also searched her home and found a small amount of “suspected” drug in their Tai Po residence. Currently, Elaine has been released on bail. When the police was conducting an interview with Elaine, she found out that Etta confessed to the police that her Mom slapped her. Elaine said, “At the time of the police investigation, I said that's impossible. It's been so many years...That kind of hitting was just a gentle slap on her arm. How painful could that be?” Nelson said, “Child abuse doesn't have to be physical. It can also be psychological abuse.” Elaine commented, “I know I did not abuse my daughter psychologically.” During the interview about her daughter, Elaine had trouble holding back her tears. During a magazine interview with Elaine, she found out that it was Etta's teacher who called the police. After talking to Etta, her teacher discovered that Etta was emotionally unstable and has considered committing suicide. Since Etta is in her puberty age, she is dealing with a lot emotional stress. At home, both Elaine and Etta only talk about happy news. In a separate interview with Etta, she admitted that she doesn't want to bother her mother with her problems. Instead, she acts like a happy child when she is at home. Since she knows she can't help her mother, she decided to ask the school for help. Etta publicly exposed her mother as an alcoholics and a smoker. Every night, she would drink two bottles of wine. After vomiting, she would continue to drink uncontrollably and even hide in the bathroom. Etta is very concerned about her mother's well-being but she knows she is unable to help mother. When Elaine would become drunk and emotionally unstable, she would push and shove her. After listening to her daughter's interview confession, Elaine admitted that she does have a communication problem with Etta. She later posted onto Weibo to explain the situation: "Kid sometimes doesn't listen. If she doesn't listen then she would make mistake. I need to teach her what's right and wrong as an adult. I did not hit her, nor was I in possession of any drug. Please don't make stuff up." Rumors were spread like wild fire since Elaine Ng carried the child of Jackie Chan back in 1999. It is said that even though Jackie was unset with Elaine for giving birth to their daughter Etta, he still paid over 30 millions HKD in breakup fees in addition to 10k monthly child support to her. But the condition was for Elaine to bring Etta to live in Shanghai forever and never set foot in Hong Kong ever again to avoid upsetting his wife Lin Feng Jiao(林鳳嬌). Elaine was living with her daughter in Shanghai for a long period of time. But in order to get her daughter a better education, she brought her back to Hong Kong with her in 2011 to enroll into a prestigious school. However, this broke the condition that she would never set foot in Hong Kong. So Jackie angrily cut off all child support. Since returning back to Hong Kong, Elaine has been under financial stress to provide for her daughter and to pay 10k yearly tuition for her to stay in private school. Elaine was a host at Commercial Radio Hong Kong for a short time but her contract wasn't renewed. She was hired by Hong Kong Cable last year. I can't really say she's at fault for teaching her daughter. I mean it's tough being single mom and she needs to work too. If anyone is to blame, it's Jackie. He's rich enough where he can give them change in his pocket and they can still lead a pretty good life. He's gotta be responsible for the mess he has caused. This is sad. This is supposed to be a private matter and it has turned into some sort of show for people. Just leave them alone already.